It’s ironic really. But designing an amazing-looking digital signage display for a surfwear shop — which needs to be about as hi-tech as an old Kombi van — is much easier than designing great signage into a bleeding-edge tech store like the Optus flagship outlet in Westfield Chermside. One’s mostly for decoration, the other benefits from being integrated into a larger digital strategy. Westfield Chermside is in suburban Brisbane and the second biggest shopping centre in Australia after Chadstone. Little wonder, then, that Optus rolled in the big guns to really nail the design and build of this store. Optus engaged boutique creative firm, Collectivus, to take care of the interior design. Unita was the builder — a go-ahead Brisbane-based firm that has fitted out just about anything worth looking at in Westfield Chermside of late. Entwined — a specialist digital signage firm that’s rolling out some of the largest networks in Australia — supplied the AV. Optus started the process knowing it wanted the store to be different. 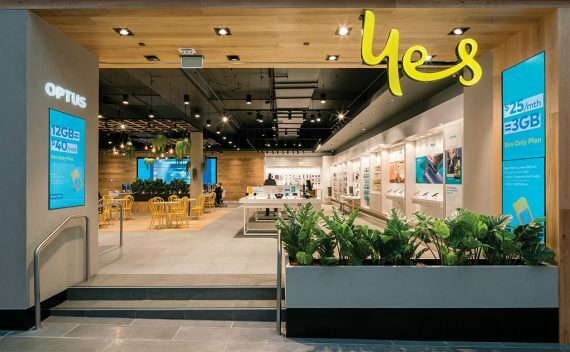 Optus talked to Collectivus about re-defining the brand’s consumer experience through some innovative retail design, and interactive zoning that moves beyond the old passive, ‘look but don’t touch’, ‘sorry-those-aren’t-actually-plugged-in’ approach. Let’s call this an ‘experiential store’. So rather than being divvied up by product, the store is led by the customer experience — what are your needs and how can the tech make your life easier? It’s personal, it’s interactive, and weirdly for a tech store, it’s even emotional. The 330sqm space reflects the brand’s softer, more inviting look that’s being rolled-out nationally. Gotta love the charge table — just place your phone onto the table and it charges. The in-store digital signage itself is a resolution of everything the customer sees from Optus out of home — whether that’s on the Optus website, in the high street, or elsewhere in the shopping mall. “Our aim is for our customers to be able to start their buying journey online and then complete or fulfil their purchase in store. The visual presence and consistency of brand remains the same online and in the store. “Further work is underway to better integrate ‘clicks and mortar’. Bridging the clicks and mortar divide is the Optus app. It’s something Frances Martin takes considerable pride in: “the Optus app is the heartbeat of the digital customer experience. Customers want to deal with us when they want and how they want. The app is the perfect vehicle for our very popular webchat customer service, among other things. With digital being so much more than decoration, the signage really is an essential strand in the retail DNA of a company like Optus. A creative agency such as Collectivus must factor tech into the design from the earliest back-of-the-serviette brainstorms. Unita knows it needs to ensure the tech is more than adequately catered for in the fitout process. And Entwined can bring its expertise to bear, as to how to get the best from the technology. All this in conjunction with Optus’s head of retail stores. There are Comments Off on DIALLED IN.